Hi! Thought I would jump on the #fridayfaves bandwagon and share 5 of my favorite things currently. I just recently started giving my skin a little more attention and this stuff is great! I have been using it for quite some time now and it does not make my skin more sensitive to the sun and I really feel like it helps with tightening the skin and diminishing wrinkles! I love anything from Naturapathica, but this is currently my favorite! It is back to school time and this platter is my absolute favorite for packing lunches for toddlers. It is so easy to clean, the lid stays on and it has the perfect number and size of compartments. Just make sure your lunch box is wide enough to fit it. I found mine locally in Athens and ReBlossom, but you can find it anywhere online if you aren't in Athens. Here is one she took of the girls in 2016! This is THE BEST water pitcher!!! It filters mercury, copper, chlorine, taste and odor, zinc and copper. The best part is that it makes the water taste AHHHMAZING! They send you a new filter every 2 months, so you don't have to remember changing it, which is very helpful in our household. This is one of the only subscription services that I have signed up for and kept for longer than a few months. Plus- the pitcher looks awesome too! I was first introduced to Moss & Marsh while shopping at ReBlossom in Athens. I was drawn to the simple, yet whimsical designs and their awesome bibs with pacifier holders! Candace is a fellow Georgian and calls Savannah home. Each one of her prints starts as a simple line drawing. That drawing becomes a repeated pattern and is then screen printed onto fine cotton fabrics. From there, each product is cut and sewn out of our one-of-a-kind textiles. Everything is TRULY handmade!!! As an avid UGA fan (GO DAWGS! ), I am currently LOVING the Bulldog print!!! I might just have to snag some of the bandanas for our three pups! That's if for the first installment of Friday Faves! Please let me know your feedback and please share your favorites too!!!! 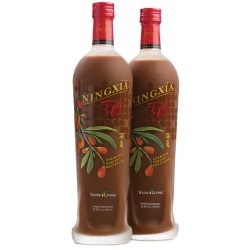 I’m obsessed with ningxia! And that water filter is so pretty…totally going to try that!